Clanard Court is a delightful boutique style four star hotel with beautiful gardens situated just 45 minutes from Dublin and 1km from Athy Town. This boutique style hotel has 38 bedrooms each opulently decorated with all modern conveniences including interactive TV and unlimited broadband access. A stylish Courtyard Bistro offers commitment to superb food in a relaxed setting. 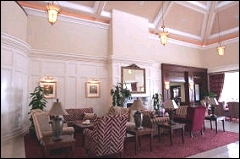 Bailey’s Bar provides a contemporary venue to meet friends or colleagues. Clanard Court is family run with strong emphasis on customer services and specializes in tailor made banqueting and events. Since opening in May 2005 we have established ourselves as a leading Wedding, Conference and Banqueting Venue in Leinster. The ideal choice for superb food and genuine warm hospitality. Clanard Court is proud of its environmentally friendly policy. It is a Green Failte award winning hotel. So why not immerse yourself in the character, charm & elegance! Facilities: All our rooms offer spacious and elegant accommodation with views of landscaped mature gardens. Each room has been designed to the highest international standard with both the needs of the business and leisure traveller in mind. Our Corporate Deluxe rooms are significantly larger, offering more space for work or leisure. Children aged 5 and under are accommodated at no additional charge in their parent’s room in a cot or rollaway bed, available on request. Smoking rooms are also available. Smoking rooms are limited and we would advise requesting this at time of booking. All the usual facilities included in rooms plus broadband internet access and interactive TV.